The team at Sofitel Hangzhou Westlake Hotel welcomes you to Hangzhou. Take advantage of our location in the heart of the capital to stroll down the famous Westlake. 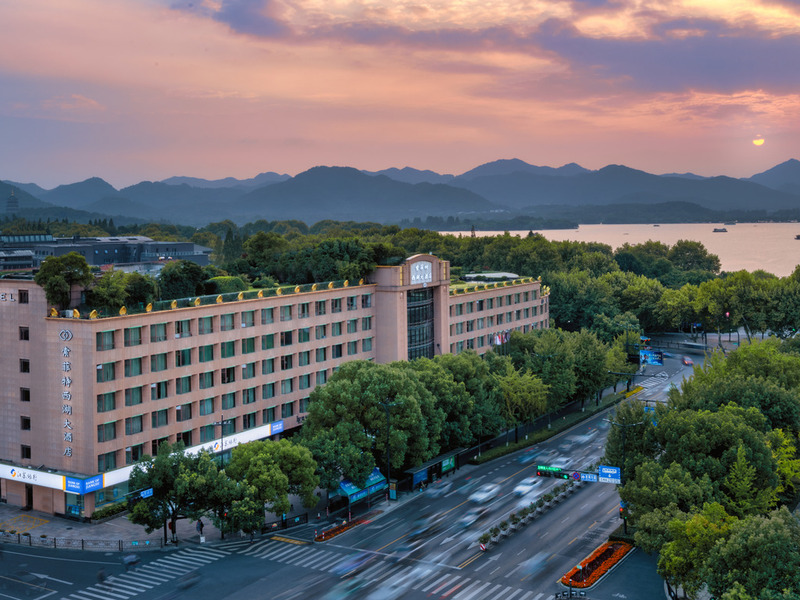 Sofitel Hangzhou West Lake sits on the picturesque banks of the West Lake, beside Hangzhou's buzzing CBD downtown and Xihutiandi complex. Meticulously renovated, the hotel has re-opened with 233 luxury rooms and suites, with a contemporary all-day dining restaurant, classic Chinese restaurant, and the chic Le Bar. The pool, beauty salon and fitness center accompanies multi-functional banquet complex, the rooftop bar Sky Garden and conference room Le Lac with panoramic views of West Lake. Unique location by The West Lake with easy access to shopping and city center. 233 well-appointed guest rooms and suites with Oriental aesthetic design and French touch. Restaurants feature the International and Hangzhou Cuisine. Rooftop Sky Garden Lounge offers breathtaking views of the West Lake and city. 180° West Lake view Terrace and natural day light Ballroom. Many of the 233 guest rooms boast stunning views of the legendary West Lake Avenue through large bay windows, and are all equipped with MyBed beds, high-speed Internet access and a wide range of digital TV channels. Rain showerheads are also available. Yong Jin Ge Chinese Restaurant is highly regarded for its authentic Hangzhou cuisine managed by our sophisticated Chinese chef with over 20 years experience, and elegant atmosphere. Six private dining rooms have their own distinctive style. The lobby bar, Le Bar, is the place "to see and be seen" and an elegant setting for cocktails, fine wines, Chinese tea and cigars. I would like to thank you all the managment team for this nice time and care, As Platinium member, I have received a very nice welcome and upgrade. I have noticed in some previous post that I have regretted that they do not use the Hermes shower and Shampoo brand. I have had the nice surprised that every night I had a set of Hermes products in my bathroom. So thank you again for this nice present, then I could really feel to be in THE SOFITEL. The only point to be improve is the English for some of the team, sometime is difficult to be understood. We came to Sofitel Hangzhou West Lake for a special occasion. We were treat very well. The room was beautiful and the bath and shower gel was amazing. We were greeted with a cake and note from the hotel which made us feel so special. Couldn't have picked a more special hotel. Thank you very much! The hotel is located very near from Westlake. The hotel staff at the reception was very friendly and upgraded our room when we checked in. The room was very spacious and well appointed.Recommend. A very lovely hotel, warmly staff. Terrific location, lovely hotel, speciously room, warmly staff.I was in the lobby struggling with a currency exchange machine. Hedy apparently saw that I was experiencing difficulty and she came to help. All of the staffs were caring, helpful. I enjoyed my stay. Everything in the room was clean and neat. One comment is that the temperature in the room was a bit high for my taste and no manual was provided on how to control the AC. Overall speaking, it was as great as imagined. A wide range of food and drinks provided in the executive lounge. Staff are also attentive and trying to address all my needs. Location is great, which is obvious without mentioning. Sofitel hotel location is the best. Next to trendy XiHuTianDi area with lots of restaurants and cafes on the lake shore of West Lake. Very convenient to everything. Hotel staff is very helpful although check-in is a little slow. Hotel facility feels somewhat aged, but works fine. The breakfast is good. The only issue is that you cannot pick cool or hot mode individually. The hotel central HVAC sets it to one mode or the other. So although it was warm, there was no air conditioning. old hotel,but service is good. I had the opportunity to spend few days at Sofitel West Lake with my wife and kids. We had a very mixed feeling about our stay in your hotel. Initially I sent you a private but since you did not answer, I decided to write this comment on Tripadvisor. First of all we would like to say that receptionnists, barman, maids and waitress/ter are all very professionnals. But unfortunately, there is a problem with the Kitchen which offered to my wife rotten or spoiled food and small piece of rope. During the first breakfast she had palm heart with her salad, unfortunately she realized after eating one palm heart that there were spoiled (green/dark color). We did not expect a 4 or 5 stars hotel to serve rotten food. Furthermore my wife is breastfeeding our last kid and it could have lead to food poisonning for both of them. We reported it to the manager who decided to offer us a bottle of wine, we appreciated the gesture even if we do not drink but at the end it does not solve the problem for your hotel. On the second day she discovered a little cord/string in her food. No risk of food poisonning this time, but still it does not match our expectations of what you should get from a Sofitel Hôtel. It was reported to your manager too. To be honest we are very disappointed by this experience. The reason why we often go to Accor group hotel is because we expect to get high standard services and food safety guarantee. Up to us this experience did not meet the required standards. Sofitel is known other than just being a great hotel, it is also about child friendly. unfortunately the experience we had in Hangzhou wasn't great. 1. The tent given to my 2 years old to play had a broken part ( a main supporting frame to the tent) that cuts her and me. Told the house keeping staff, she send in a maintenance guy, who tried just to tape down the broken part but ended cutting himself on his finger as well. However, it was a quick remedy by the house keeping team ( an effort I must admit) they bring in another tent for her to play, brought in anti septic lotion and plaster for us. kudos to that. 2. There is a in room card stating that there is a Special meal for kids prepared by Chef on daily basis. When we called room service, they doesn't seem to know, they send up a waiter from the cafe. Who eventually took a photo of the card using his handphone and told us he will check and find out more as he is unaware of it too. but never got back to us. 3. lastly, Sofitel is about the little Fox for the kid to play, we were told that it ran of of stock for weeks already, However, Sofitel Hangzhou do have a excellent F&B service team and front office. Good location and lake view hotel from terrace. I stay 2 nights at Sofitel. The room is good. But I feel that all staffs don’t speak English well. They have done error and not allow me to have access to the lounge with my platinum status. After complaining then they try to understand why I was not happy then finally they accept. As always, an excellent experience! A great effort from the team at Hangzhou Westlake making my stay seamless and smooth. Thanks a lot! Reception has presented the welcome by offer a drink at lobby bar, rooms are upgraded. Excellent location, 3-mins walk and you will be at xihu . I would recommend for visitors planned for 2-3days trip. Nice room, with functioning well shower room, no water leak out from the glass door. Reasonable wifi speed. Comfortable pillows. Very nice restaurant and smoking area on the 5th floor. Very helpful and friendly front desk and taxi booking stuffs. Good balance location for traveling to Binjiang for work and personal needs in west lake area after business. Good location and nicely decorated spacious room. Really enjoyed my stay at Sofitel, the location is very handy for most of Hangzhou's attractions and convenient for Ding An Road metro station. The staff are always pleasant and very helpful.